Some students arrive on campus with thousands of followers on their social network profiles. How can you leverage their following and other micro-influencers to endorse your establishment? A third of Generation Z want to grow up to be professional influencers. Becoming a social media star is their fourth most popular career aspiration, ranking well above actor or pop star. So it's no surprise that some students have thousands of followers and an enviable magnetism online. In this blog post, we outline what an influencer is and how they can benefit your institution's marketing activity. Social media has changed marketing, and personal opinions have become much more important. Enter the influencer, a new breed of social media leaders and content creators who can make a living through social media, spreading messages and promoting products. An influencer has an engaged audience, authenticity and an ability to sway decision making and they operate much like a celebrity spokesperson but on a more targeted basis. There is a subset of this group called micro-influencers who typically have smaller focused audiences (2,000 to 100,000 followers), but with potentially higher levels of engagement than large-scale influencers. 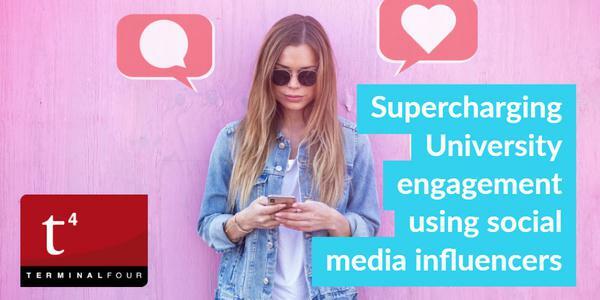 The university market is a perfect incubator for both influencers and micro-influencers and universities are starting to work with them to create deep levels of engagement with their institution. Student influencers differ from university ambassadors. They operate independently, are in control of their output and dictate how an organization or branded content is interwoven into their overall activity. Whether they are bloggers, vloggers or social media stars, using influencers requires a high level of trust between the university and the individual. The care of the university's reputation is partly in their keeping, and you must be sure the influencer's personality and content align with the overall image and positioning of the institution. However, when influencers align with the institution the return on investment can be very high in terms of reaching new audiences and extending the reach of your creative marketing content. Institutions such as Ohio Wesleyan University and Babson College are actively benefiting from partnerships with charismatic students, using them to produce video content, showcase university life and act as ambassadors to the outside world. Markian Benhamou, @Markianb, is a shining example of the potential of student influencers, and currently a business student from the University of Southern California. With over 105k YouTube subscribers, 250k followers on Instagram, and a staggering 2.3m Facebook followers, he has a reach as extensive as most universities. However, the market is still trying to ascertain the best ways to use student influencers for maximum benefit. 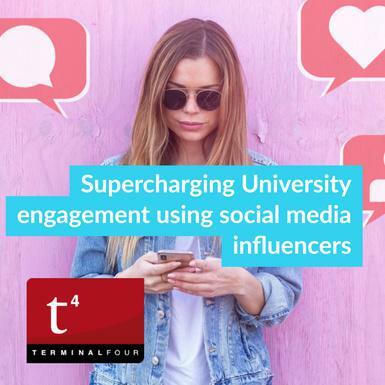 At a high level, influencer groups are ideal for reaching a broader audience, for undertaking market research with a large forum, amplifying institution content, supporting SEO activity and showcasing positive elements of student life. However, for marketing departments, the best use of influencers is dependent on the specific objectives and strategy of campaigns. Some institutions will use influencers to reach prospective students, others may want to change the positioning and narrative of the institution, or perhaps to raise the profile of research and education at the university. Any combination of objectives are feasible, and many universities will want to activate different influencer campaigns simultaneously. Student recruitment and fundraising are both areas that can benefit from well-executed influencer campaigns. From a recruitment standpoint, influencers with high relevancy, engagement, and content that have made an application to the university but are yet to start university could be approached to build further loyalty for the institution in their network and potentially convert applicants who are considering multiple universities. You can also build up a detailed picture of life on campus for prospective students by connecting with popular current student influencers. So by recruiting influencers with specialist subject interests, you can build a deeper connection with prospects that have an interest in particular courses. Loyola Marymount University (LMU) for instance wanted to raise their presence nationally. They identified and targeted relevant influencers with over 50,000 followers with significant mentions of LMU. LMU is leveraging a connection with these influencers in campaigns such as the school's annual day of giving. Successful alumni and thought leaders make great influencer\ as they can permeate stories about employability and knowledge that resonates with both prospective and current students. They can also support fundraising appeals and encourage other alumni to connect and support the institution. Cardinal Stritch University (Stritch) had an objective of connecting and engaging with alumni. Their alumni manager found multiple alumni who were active online, writing for publications, and mentioning Stritch. The University then built those relationships further to ask for their inclusion in alumni content online and in print. The opportunities to develop positive exposure for the institution are endless, so the challenge is to have a clear strategy and to find influencers who are the right fit for the objectives of the strategic campaigns. Many institutions, like the University of North Carolina in the US and St Andrews University in the UK, now have established publicly visible ambassador programmes. They utilize successful alumni, graduates and well-connected students to promote courses and attract students through authentic ambassador content. However, in the future institutions are likely to complement their ambassador activity with greater use of carefully selected influencers and online personalities to promote the university. We could even be entering an era of low-cost education provision, specifically for students who can bring their influence to the table before joining a university. In part two we cover how you can successfully find and recruit student influencers. If your marketing team already has influencer marketing activity in play or is considering developing an influencer network to support your student recruitment activity, we'd love to hear from you. Do you know all your students who have over 10,000 or 100,000 followers?